Posted in Bookbinding & Bookbinders. Published by: English Illustration (1891)? 245 x 170mm, 5 leaf journal article 9323-332p). Illust. 9 mono. 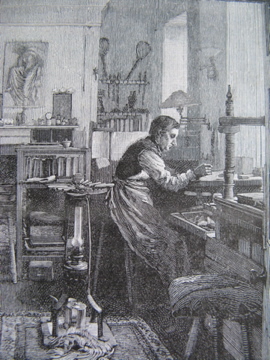 plates of C-S bindings and an engraving of the binder in his studio. Sewn within a card cover with typed paper label. An interesting contemporary article on the work of the binder with samples of his work. Slight handling marks. 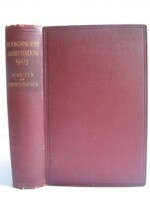 Bookbinders’ Arbitration 1903. 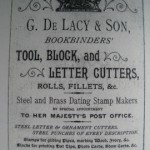 – This copy has a Presentation plate of the London (Letterpress) Bookbinders’ Trade Societies to the Shop Associations of Messrs Eyre & Spottiswoodes Binding Department, British Museum, dated January, 1904 and signed in ink by G.W Knecht ( a negotiator for the employees). A RARE AND INTERESTING VOLUME.